The Lodge has 12 rooms, all en suite with a/c and hot water, and wireless internet connection. The lodge is set back just 100 metres from Saud Beach. Five rooms are in a more modern style, there is one separate native cottage and six rooms are of a traditional thatched roof style. We have a bar & restaurant and a small 24 / 7 shop selling drinks & snacks. Where is Pagudpud? Pagudpud or Pagudpod as its every so often called is wonderful one day and great the next. many let know it's the Boracay of the North, We pronounce it is Boracay as it once was! And that's why it's so popular. It is Boracay as it was 25 years ago! 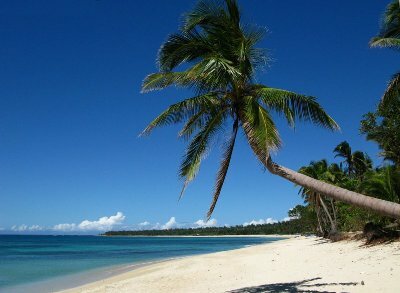 The consummate white sands of Saud Beach are located at Pagudpud. The sleepy rural coastal village of Pagudpud is situated on the most Northern tip of Luzon, in the Philippines and is about 50 miles up the coast from Laoag City, the capital of Ilocos Norte province. It is also roughly 350 miles north of Manila, you might drive, catch a motorcoach or take a flight to Laoag City. The community is situated to the northwards of Bangui and its now famed windmills and inland lies the massive Cordillera Mountain Range, the largest mountain range in the Philippines. over the other side of the mountain range lies the province of Cagayan. To the North and the West are the warm waters of the South China Sea. Foreign tourists are now becoming really interested and lately one of Australia's most well-thought-of and notable international travel writers ranked Saud Beach as Number 1 on the list of the Top Ten best Asian Beaches. Discover Pagudpud before the tourists find out. The local district comprises really fine-looking and almost deserted beaches, dramatic waterfalls, beautiful picturesque vistas, and a real genuine get away from the rat race feeling.